What Does It Mean to be Not Of This World As a Christian? 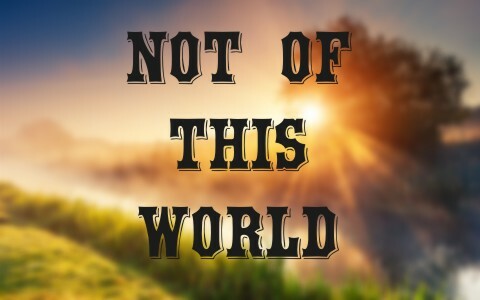 Many Christians today are familiar with the phrase, “Not of this world.” It was spoken by Jesus when He was being interrogated by Pontius Pilate just before Jesus was crucified. Unfortunately, many Christians know this phrase from a popular clothing line, but do not understand the theological significance of these words. Because of the this, it is important that we understand the significance of what does it mean to be not of this world as a Christian. What is the context of the phrase, Not of this world? In this exchange, Pilate asked Jesus if He was the King of the Jews. It is clear from the text that Pilate was approaching his line of questioning with the idea that Jesus considered Himself a king in earthly terms. This is clear when Pilate asked Jesus, “Am I a Jew?” Pilate was trying to see if Jesus would claim that He was a king over Pilate, which would have been treason as Pilate was a government official over Judea under the Emperor Tiberius. However, Jesus did not take the bait. When Pilate asked Jesus why the people and the chief priests delivered Him to Pilate, Jesus instead described His kingdom. John 18:26 describes His kingdom as being “not of this world.” He added that if His kingdom was of this world, His servants would have fought to prevent Him from being delivered to the Jews. Jesus continued by describing that he was born to become a king, but at that time, He was there to bear witness to the truth. What is the theological significance to what Jesus said? We see from this passage that in His time, Jesus Christ shall appear and show Himself and His kingdom to the world. However, while He stood before Pilate, it was not the time. What significance should this have to Christians? As children of God by faith in Christ, we also become children of Abraham (Galatians 3:6-9; Galatians 3:26). As children of Abraham, we become heirs of the promises God made to Abraham because we have the seed of Abraham (Christ) in us (Galatians 3:13-16; Galatians 3:22-29). As heirs, we have an inheritance waiting for us, guaranteed by the Holy Spirit and kept by God (Ephesians 1:13-15; 1 Peter 1:3-5). That inheritance is the kingdom of God and we receive it when we pass from this mortal life (Matthew 25:34; 1 Corinthians 15:35-57; James 2:5). Likewise, those who have not trusted Christ are not heirs to the kingdom (1 Corinthians 6:9-10). For Christians, this also means that we are no longer citizens of this world, we are citizens of Christ’s kingdom. As such, we are called to serve as ambassadors of Christ to those in this world (Matthew 6:10; 1 Corinthians 5). As ambassadors, we are called to minister and suffer for sharing the message and doing work for the kingdom of Christ (1 Corinthians 6:1-10). In doing so, we must work hard and fight the good fight without becoming entangled in the affairs of this world, which is destined to pass away (2 Timothy 2:1-16). Many Christians today are familiar with the phrase, “Not of this world.”. In John 18:26 Jesus described His kingdom as being “not of this world” when He was being interrogated by Pontius Pilate just before Jesus was crucified. In context, Jesus was describing His kingdom to come, of which, born again believers are citizens and heirs. Therefore, as citizens and heirs by faith in Christ, we are called to devote our lives to working for Christ’s kingdom, which is not of this world. A helpful article about an interesting subject, thank you for this. Previous post: Who Was Goliath In The Bible? Next post: Who Was Legion In The Bible?